World map of countries by their raw ecological footprint, relative to the world average biocapacity (2007). National ecological surplus or deficit, measured as a country's biocapacity per person (in global hectares) minus its ecological footprint per person (also in global hectares). Data from 2013. The ecological footprint measures human demand on nature, i.e., the quantity of nature it takes to support people or an economy. It tracks this demand through an ecological accounting system. The accounts contrast the biologically productive area people use for their consumption to the biologically productive area available within a region or the world (biocapacity, the productive area that can regenerate what people demand from nature). In short, it is a measure of human impact on Earth's ecosystem and reveals the dependence of the human economy on natural capital. Footprint and biocapacity can be compared at the individual, regional, national or global scale. Both footprint and biocapacity change every year with number of people, per person consumption, efficiency of production, and productivity of ecosystems. At a global scale, footprint assessments show how big humanity's demand is compared to what planet Earth can renew. Since 2003, Global Footprint Network has calculated the ecological footprint from UN data sources for the world as a whole and for over 200 nations (known as the National Footprint Accounts). Every year the calculations are updated with the newest data. The time series are recalculated with every update since UN statistics also change historical data sets. As shown in Lin et al (2018) the time trends for countries and the world have stayed consistent despite data updates. Also, a recent study by the Swiss Ministry of Environment independently recalculated the Swiss trends and reproduced them within 1-4% for the time period that they studied (1996-2015). Global Footprint Network estimates that, as of 2014, humanity has been using natural capital 1.7 times as fast as Earth can renew it. This means humanity's ecological footprint corresponds to 1.7 planet Earths. Ecological footprint analysis is widely used around the Earth in support of sustainability assessments. It enables people to measure and manage the use of resources throughout the economy and explore the sustainability of individual lifestyles, goods and services, organizations, industry sectors, neighborhoods, cities, regions and nations. Since 2006, a first set of ecological footprint standards exist that detail both communication and calculation procedures. The latest version are the updated standards from 2009. For 2014, Global Footprint Network estimated humanity's ecological footprint as 1.7 planet Earths. This means that, according to their calculations, humanity's demands were 1.7 times faster than what the planet's ecosystems renewed. Ecological footprints can be calculated at any scale: for an activity, a person, a community, a city, a town, a region, a nation, or humanity as a whole. Cities, due to their population concentration, have large ecological footprints and have become ground zero for footprint reduction. The ecological footprint accounting method at the national level is described on the web page of Global Footprint Network  or in greater detail in academic papers, including Borucke et al. The focus of Ecological Footprint accounting is biological resources. Rather than non-renewable resources like oil or minerals, it is the biological resources that are the materially most limiting resources for the human enterprise. For instance, while the amount of fossil fuel still underground is limited, even more limiting is the biosphere’s ability to cope with the CO2 emitted when burning it. This ability is one of the competing uses of the planet’s biocapacity. Similarly, minerals are limited by the energy available to extract them from the lithosphere and concentrate them. The limits of ecosystems' ability to renew biomass is given by factors such as water availability, climate, soil fertility, solar energy, technology and management practices. This capacity to renew, driven by photosynthesis, is called biocapacity. Per capita ecological footprint (EF), or ecological footprint analysis (EFA), is a means of comparing consumption and lifestyles, and checking this against biocapacity - nature's ability to provide for this consumption. The tool can inform policy by examining to what extent a nation uses more (or less) than is available within its territory, or to what extent the nation's lifestyle would be replicable worldwide. The footprint can also be a useful tool to educate people about carrying capacity and overconsumption, with the aim of altering personal behavior. Ecological footprints may be used to argue that many current lifestyles are not sustainable. Such a global comparison also clearly shows the inequalities of resource use on this planet at the beginning of the twenty-first century. According to the 2018 edition of the National Footprint Accounts, humanity’s total ecological footprint has exhibited an increasing trend since 1961, growing an average of 2.1% per year (SD= 1.9). Humanity’s ecological footprint was 7.0 billion gha in 1961 and increased to 20.6 billion gha in 2014. The world-average ecological footprint in 2014 was 2.8 global hectares per person. The carbon footprint is the fastest growing part of the ecological footprint and accounts currently for about 60% of humanity’s total ecological footprint. The Earth’s biocapacity has not increased at the same rate as the ecological footprint. The increase of biocapacity averaged at only 0.5% per year (SD = 0.7). Because of agricultural intensification, biocapacity was at 9.6 billion gha in 1961 and grew to 12.2 billion gha in 2014. 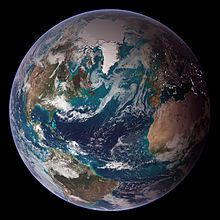 Therefore, the Earth has been in ecological overshoot (where humanity is using more resources and generating waste at a pace that the ecosystem can’t renew) since the 1970’s. In 2018, Earth Overshoot Day, the date where humanity has used more from nature than the planet can renew in the entire year, was estimated to be August 1. Now more than 85% of humanity lives in countries that run an ecological deficit. This means their ecological footprint for consumption exceeds the biocapacity of that country. A 2017 study published in Environmental Research Letters posited that the most significant way individuals could reduce their own carbon footprint is to have fewer children, followed by living without a vehicle, forgoing air travel and adopting a plant-based diet. The 2017 World Scientists' Warning to Humanity: A Second Notice, co-signed by over 15,000 scientists around the globe, urges human beings to "re-examine and change our individual behaviors, including limiting our own reproduction (ideally to replacement level at most) and drastically diminishing our per capita ­consumption of fossil fuels, meat, and other resources." According to a 2018 study published in Science, avoiding animal products altogether, including meat and dairy, is the most significant way individuals can reduce their overall ecological impact on earth, meaning "not just greenhouse gases, but global acidification, eutrophication, land use and water use". ^ "Open Data Platform". data.footprintnetwork.org. Retrieved 2018-03-30. ^ Environmental Footprints of Switzerland. Federal Office for the Environment. 2018. p. 87. ^ "Data Sources". Global Footprint Network. 2017-04-17. Retrieved 2017-04-16. ^ "Open Data Platform". data.footprintnetwork.org. Retrieved 2018-10-10. ^ Lyndhurst, Brook (June 2003). "London's Ecological Footprint A review" (PDF). Mayor of London. Greater London Authority (commissioned by GLA Economics). 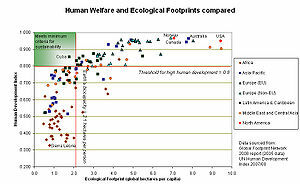 ^ Global Footprint Network "Ecological Footprint: Overview." Retrieved on April 16, 2017. ^ Global Footprint Network. 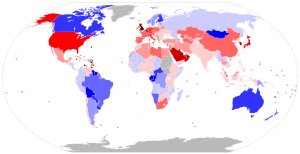 "Ecological Footprint Standards 2009". Global Footprint Network. Retrieved 16 July 2018. ^ Tyszczuk, Renata. "Most poignantly... cities in the Anthropocene will remain the 'ground zero'". Academia.edu. ^ "Methodology and Data". Global Footprint Network. Retrieved 15 July 2018. ^ Borucke, M; Moore, D; Cranston, G; Gracey, K; Lazarus, E; Morales, J.C.; Wackernagel, M. (2013). "Accounting for demand and supply of the biosphere's regenerative capacity: The National Footprint Accounts' underlying methodology and framework". Ecological Indicators. 24: 518–533. doi:10.1016/j.ecolind.2012.08.005. ^ Rees, William E. (October 1992). "Ecological footprints and appropriated carrying capacity: what urban economics leaves out". Environment and Urbanisation. 4 (2): 121–130. doi:10.1177/095624789200400212. ^ Wackernagel, Mathis, 1991. "Land Use: Measuring a Community's Appropriated Carrying Capacity as an Indicator for Sustainability"; and "Using Appropriated Carrying Capacity as an Indicator, Measuring the Sustainability of a Community." Report I & II to the UBC Task Force on Healthy and Sustainable Communities, Vancouver. ^ Findhorn eco-footprint is ‘world’s smallest’ Archived 2009-01-23 at the Wayback Machine Sunday Herald, August 11, 2008. "A new expert study says the multinational community's ecological footprint is half the UK average. This means Findhorn uses 50% fewer resources and creates 50% less waste than normal." ^ Alden Wicker (1 March 2017). "Conscious consumerism is a lie. Here's a better way to help save the world". Quartz. Retrieved 13 February 2018. A 2012 study compared footprints of “green” consumers who try to make eco-friendly choices to the footprints of regular consumers. And they found no meaningful difference between the two. ^ Csutora, M. "The ecological footprint of green and brown consumers. Introducing the behaviour-impact-gap (BIG) problem" (PDF). European Round Table on Sustainable Consumption and Production (ERSCP) 2012. 15th European Roundtable on Sustainable Consumption and Production. Retrieved 13 February 2018. The research found no significant difference between the carbon footprints of green and brown consumers suggesting that individual environmental behaviour does not always modify consumption patterns significantly. ^ Perkins, Sid (July 11, 2017). "The best way to reduce your carbon footprint is one the government isn't telling you about". Science. Retrieved April 8, 2018. ^ Carrington, Damian (May 31, 2018). "Avoiding meat and dairy is 'single biggest way' to reduce your impact on Earth". The Guardian. Retrieved March 29, 2019. ^ Fiala, N. (2008). "Measuring sustainability: Why the ecological footprint is bad economics and bad environmental science". Ecological Economics. 67 (4): 519–525. doi:10.1016/j.ecolecon.2008.07.023. ^ Blomqvist, L.; Brook, B.W. ; Ellis, E.C. ; Kareiva, P.M.; Nordhaus, T.; Shellenberger, M. (2013). "Does the shoe fit? Real versus imagined ecological footprints". PLoS Biol. 11 (11): e1001700. doi:10.1371/journal.pbio.1001700. PMC 3818165. PMID 24223517. ^ Rees, W.E. ; Wackernagel, M. (2013). "The Shoe Fits, but the Footprint is Largerthan Earth". PLoS Biology. 11 (11): e1001701. doi:10.1371/journal.pbio.1001701. PMC 3818166. PMID 24223518. ^ Blomqvist, L.; Brook, B.W. ; Ellis, E.C. ; Kareiva, P.M.; Nordhaus, T.; et al. (2013b). "The ecological footprint remains a misleading metric of global sustainability". PLoS Biol. 11 (11): e1001702. doi:10.1371/journal.pbio.1001702. PMC 3818167. PMID 24223519. ^ Giampietro, M. Saltelli A. (2014a): Footprint to nowhere, Ecological Indicators 46: 610–621. ^ Goldfinger; Wackernagel, S. M.; Galli, A.; Lazarus, E.; Lin, D. (2014). "Footprint facts and fallacies: A response to Giampietro and Saltelli (2014) "Footprints to Nowhere"". Ecological Indicators. 46: 622–632. doi:10.1016/j.ecolind.2014.04.025. ^ Giampietro, M.; Saltelli, A.; et al. (2014b). "Footworking in circles: Reply to Goldfinger et al. (2014) "Footprint Facts and Fallacies: A Response to Giampietro and Saltelli (2014) Footprints to nowhere"". Ecological Indicators. 46: 260–263. doi:10.1016/j.ecolind.2014.06.019. ^ Van; den Bergh, J.; Grazi, Fabio (2015). "Reply to the first systematic response by the Global Footprint Network to criticism: A real debate finally?". Ecological Indicators. 58: 458–463. doi:10.1016/j.ecolind.2015.05.007. ^ F. Grazi; J.C.J.M. van den Bergh; P. Rietveld (2007). "Welfare economics versus ecological footprint: modeling agglomeration, externalities and trade". Environmental and Resource Economics. 38 (1): 135–153. doi:10.1007/s10640-006-9067-2. hdl:1871/23693. ^ Newman, Peter (October 2006). "The environmental impact of cities". Environment and Urbanization. 18 (2): 275–295. doi:10.1177/0956247806069599. ISSN 0956-2478. ^ "Planning and Markets: Peter Gordon and Harry W. Richardson". Pam.usc.edu. Retrieved 2012-11-08. ^ Lenzen, Manfred; Murray Shauna A. (2001). "A modified ecological footprint method and its application to Australia". Ecological Economics. 37 (2): 229–255. doi:10.1016/S0921-8009(00)00275-5. ^ Alex Kirby (13 December 2004). "Pollution: A life and death issue". BBC News. Retrieved 2008-01-31. ^ Alex Gabbard. "Coal Combustion: Nuclear Resource or Danger". Oak Ridge National Laboratory. Archived from the original on 2007-02-05. Retrieved 2008-01-31. ^ Report identifies population and consumption as an environmental priority Archived 2016-10-18 at the Wayback Machine, accessed 6 March 2016. ^ "Humanity Now Demanding 1.6 Earths". Global Footprint Network. Retrieved 16 April 2017. ^ Benn, Hilary; Milliband, Ed. "Guidance on how to measure and report your greenhouse gas emissions" (PDF). GOV.UK. Department for Environment, Food and Rural Affairs (UK). Retrieved 9 November 2016. ^ "The Human Nature of Unsustainability". Retrieved 29 July 2016. ^ "Anthropocene: Age of Man - Pictures, More From National Geographic Magazine". Retrieved 29 July 2016. Wackernagel, M; Schulz, NB; Deumling, D; Linares, AC; Jenkins, M; Kapos, V; Monfreda, C; Loh, J; et al. (2002). "Tracking the ecological overshoot of the human economy". Proc. Natl. Acad. Sci. U.S.A. 99 (14): 9266–71. doi:10.1073/pnas.142033699. PMC 123129. PMID 12089326. F. Grazi; J.C.J.M. van den Bergh; P. Rietveld (2007). "Welfare economics versus ecological footprint: modeling agglomeration, externalities and trade". Environmental and Resource Economics. 38 (1): 135–153. doi:10.1007/s10640-006-9067-2. hdl:1871/23693. Ohl, B.; Wolf, S.; & Anderson, W. (2008). "A modest proposal: global rationalization of ecological footprint to eliminate ecological debt". Sustainability: Science, Practice, & Policy. 4 (1): 5–16. doi:10.1080/15487733.2008.11908010. Archived from the original on 2009-01-24. Retrieved 2009-03-11.